There are many ways Marvel’s Black Panther is ground-breaking. I don’t think story is one of them, except in the sense of that Marvel magic allowing for a productive cross-genre mish-mash. We’ve got origin stories. We’ve got daddy issues. We’ve got ritual battles for dominance. We’ve got mythological powers and dream quests. And we have the most wonderful if unlikely core issue of all: a “third world African” country that is actually a technologically advanced paradise with ideas and innovations even Reed Richards never thought of, powered by an alien stash of MacGuffin metal called Vibranium (which is either the strongest or the most bouncy metal in the world, I guess because Adamantium is still owned by the other guys: you can’t interchange all the magic metals any more than you can turn Inhumans into mutants, guys, but nice try). 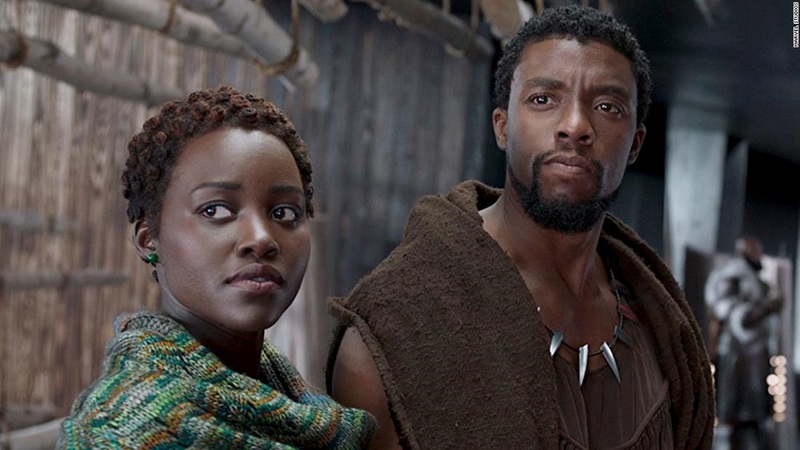 The other mish-mash on hand is that despite living in a cloaked futuristic city, the power dynamic is ancient and feudal, which makes for great story points among the five tribes of Wakanda (each nicely differentiated by costume and chosen animal attributes), but surely this is a pretty inefficient form of government. Still, it allows for very dramatic moments and the most thrilling sequence of all (the one that feels like stakes are highest) is the royal family fleeing for their lives and seeking allies among former enemies when the expected establishment is overturned by a brash outsider. That power struggle divides friendships, as we learn Nakia (the king’s beloved) can’t expect any help from Okoye (the leader of the King’s guard) because the latter’s loyalty is to the position, not the individual. It’s intense to watch the two women (Lupita Nyong’o and Danai Gurira) deal with this harsh truth in crisis, and the latter pretty much steals every scene she’s in. She is, like the rest of the Dora Milaje, formidable, fierce, stylish and ruthless at her job, all at once and all the damn time! You can’t take your eyes off her. Klaue is one of the villains, and while Andy Serkis chews as much scenery as he can grab at all times, his racism is toned down (he mostly seems to resent that the Wakandans pretend to be something less than what they are) and his screen time is blessedly limited. This is an enjoyable, if long-winded and very ornate, action film, and visually it is consistently stunning. I’ve been writing about Shakespeare on film here at Psycho Drive-In for a little while now, and Black Panther might just be the most Shakespearean film I’ve seen. This movie gives us clear lines of succession, usurpation of the throne, interfamily turmoil, and political discourse. Oh, yeah, and it’s a Marvel Comics superhero movie. Remember when the intergalactic lightheartedness of Guardians of the Galaxy and later the interdimensional trippy-ness of Doctor Strange broadened the fabric of the Marvel Cinematic Universe? 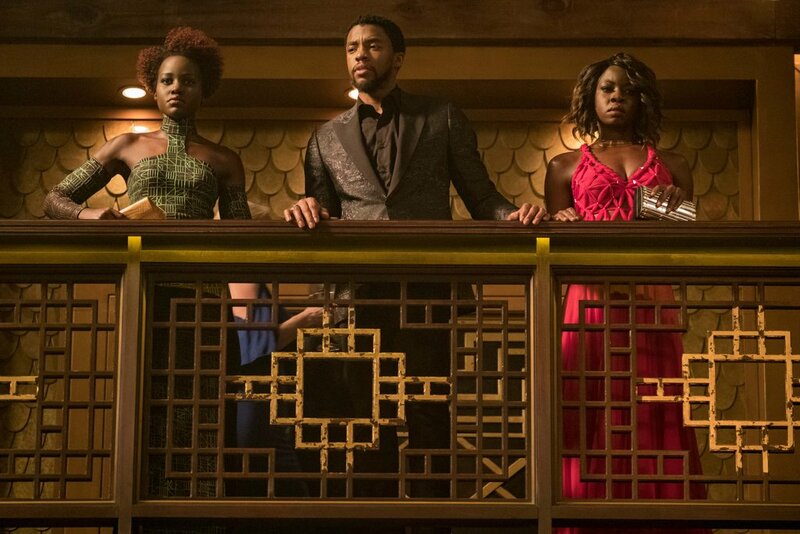 Black Panther is yet another departure for the MCU, but one that grounds the ever-growing universe and provides a center for everything else to revolve around (dare I say it?) in much the same way Tony Stark and his technology did for many of the previous entries in the series. The most striking part of this film for me personally was the powerful metaphor that is the nation of Wakanda. Here is a country nestled in deepest Africa. To most outside observers, it could easily be regarded as one of those so-called “shithole countries” (not my term) with little to offer the outside world. However, behind that façade lies a nation rich in development, culture, and technology. There are those here in the western world that might dismiss a country such as Wakanda, failing to see how it could contribute to the betterment of our world. Sure, Wakanda has chosen to maintain its secrets, but this choice is easily maintained by the prejudices of the western world. This point is made throughout the film, but is illustrated perfectly in the mid-credit scene (which I won’t spoil here). You know, speaking as white boy with what I like to think of as a reasonably fair-minded social conscience, I was a little nervous walking into the theatre that I was about to sit through a “movie about black people made for white people.” These misgivings were dispelled quickly and thoroughly. There was no pandering or hesitation in embracing the culture of the Wakandan people, and while some of their rituals might have seemed foreign to a wide audience, it was not at all apologetic in its presentation. That commitment shines as pure confidence and class. If I had to offer a criticism of the performances, it would be that Danai Gurira’s incredible Okoye nearly steals the film’s action from Chadwick Boseman’s lead character. And that wouldn’t actually be a criticism at all, because I thought it was awesome. Okoye, as part of the Dora Milaje royal guard, really should see more action than the king she’s sworn to protect. And she nearly does. Watch for that bit with the spear and the SUV. That’s all I’m gonna say. And the same could be said for most of the female cast of this film. I hate to make a big thing about it, but it is a damn fine thing to see a tentpole blockbuster action flick carried by a predominantly female African-American cast. 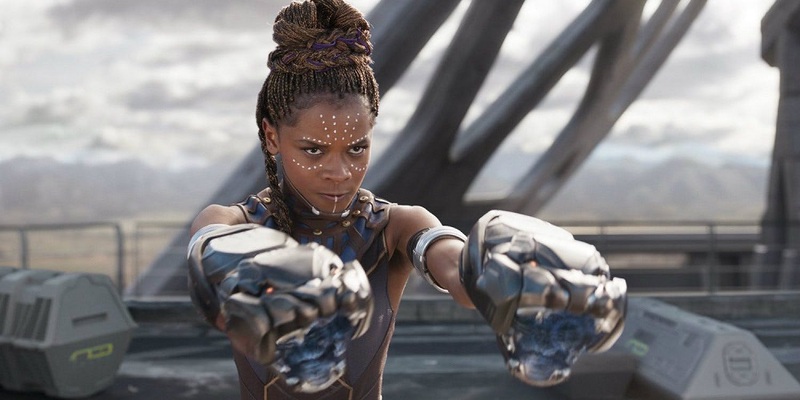 Sure, Bozeman is the title character (and makes a damn fine job of it), but Lupita Nyong-o’s Nakia stands as King T’Challa’s conscience throughout the movie, as much as Letitia Wright’s Shuri keeps him humble as only a kid sister can. 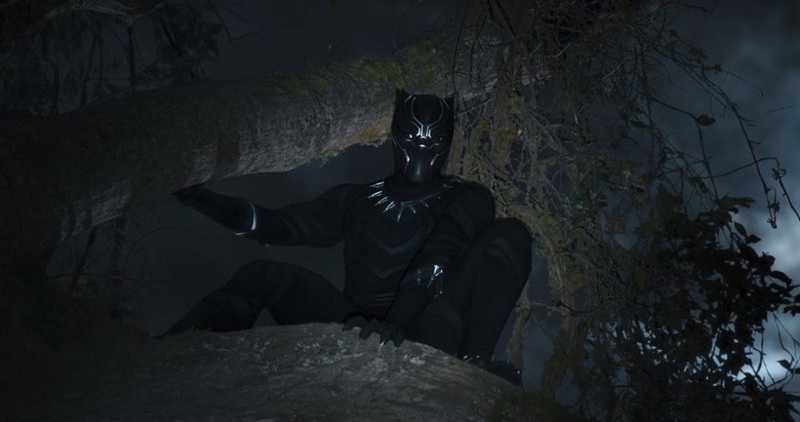 It’s clear that T’Challa could not do what he needs to do without the strength of the people around him. And the fact that those people are nearly exclusively female is handled as an accepted fact of nature rather than a political movement serves to exhibit Wakanda’s cultural advancement as much as (if not more than) their wicked-cool technology. Michael B. Jordan is the antagonist Erik Killmonger, but it doesn’t seem proper to refer to him as a villain. Sure, he does some heinous stuff to our heroes and certainly qualifies. But his goals and justifications, even though tempered through his personal anger, are understandable. And in the end, T’Challa and the rest of Wakanda are fluidly transformed forever through an acceptance of (at least part of) Killmonger’s revolutionary platform. Andy Serkis is the other big bad Ulysses Klaue. He was last seen in Avengers: Age of Ultron scrabbling for scraps of the treasured vibranium. In Black Panther, his operation crescendos, and the allegory to the African “blood diamond” trade was not lost on this viewer. If nothing else can describe the excellence of this cast, it should be the fact that Martin Freeman is the afterthought at the end of my review. Being a huge fan of Tim from the original BBC version of The Office and Arthur Dent in the criminally underappreciated Hitchhiker’s Guide to the Galaxy from 2005, it’s safe to say that I would be most likely to tag him nearer the headline of any review of a movie in which he appears. It could be argued that nearly every major role Martin has ever taken could be described as a “fish out of water” character, from Bilbo Baggins to John Watson to Lester Nygaard. But the thing is, he’s just so damn good at it. His CIA agent Everett K. Ross is no exception. But even my fanboy-ism could not overshadow the overwhelming strength of the rest of this cast. So, if you’re one of the three or four people who haven’t yet seen Black Panther, go see it. Allow yourself to be wrapped up in this gorgeous cultural tapestry. This world is far bigger and more interesting than we can possibly imagine. And now, so is the Marvel Cinematic Universe.